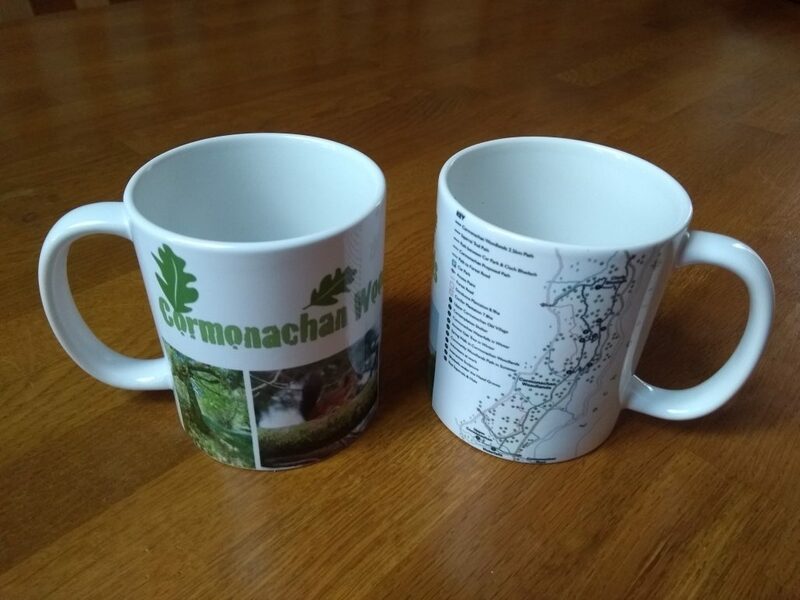 Cormonachan Woodlands Mugs are now available again from the Secretary of the Cormonachan Woodlands Association at a cost of £7.50 each including boxed packaging – if postage is required for delivery, the postage cost is £2.95 each extra. For contact details, see the bottom of our website pages. Two sides of the mug are shown here. The sale of these mugs will help to support the ”Upper Cormonachan Paths Project Fund”. These mugs will be on sale at the Carrick Fayre in Carrick Castle on Sunday 14th July, Loch Goil Gala Day on Saturday 3rd August and at the Autumn Fayre in Lochgoilhead in September. funding and donations will be necessary. for up to 5% of the project costs from donations, an amount of £13,500.00 as a target. meet the objectives of the local Loch Goil Community Action Plan and the National Park’s own plans. Planning permission is due by mid-March. Community Trust and Carrick Castle Community Trust are supporting the paths project. 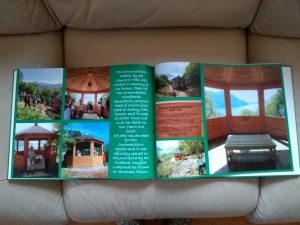 Community Woodlands to members and visitors and boast tourism to the Loch Goil area for local businesses. Association’s notice board in the car park. You can “Donate“ here or on the bottom of our Home page. Your donation would be very much welcomed! material for the paths has been reduced by negotiation for the quantities to be supplied by the quarry. agreement with Forest Enterprise Scotland early last year for the CWA to manage Cormonachan Woodlands. for 5% of the project costs from donations, an amount of £13,500.00 as a target. 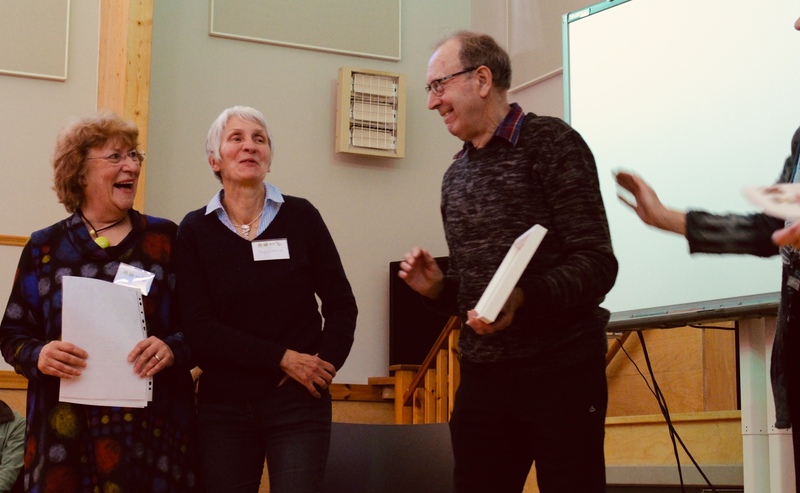 The awards as always are a lovely part of the day at the Communities Partnership’s Annual Gathering on 27th October 2018 that support communities in the Loch Lomond & Trossachs National Park and it was warming to see the reaction of everyone there when they learned that our young environmentalist’s award was in memory of Liz Evans. They talked about her life as Chair of the Cormonachan Woodlands Association on the west shore of Loch Goil, (mentioning that it was a joint woodlands project that was started in 1998, with co-operation between Ardroy Outdoor Education Centre, Lochgoil Community Trust, Lochgoil Primary School and Forest Enterprise Scotland and is now under a new not-for-profit organisation, Cormonachan Woodlands Association, founded in 2015). 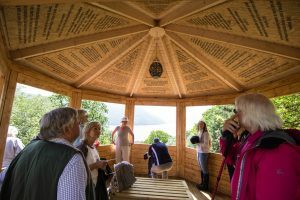 It was also mentioned that a special Contemplation Shelter built in Liz’s memory overlooking Loch Goil is open all year round and is a quiet place where many quotations about Liz can be read. They encouraged all the guests to pay a visit to her contemplation shelter and the woodlands. 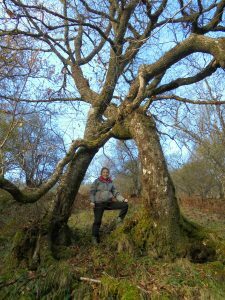 Liz Evans by the “Loving Trees” in Cormonachan Woodlands on 12th November 2017, 6 weeks before she died. This year two very inspirational young men received a joint award for Young Environmentalist of the Year for their own individual contribution to environmental conservation. 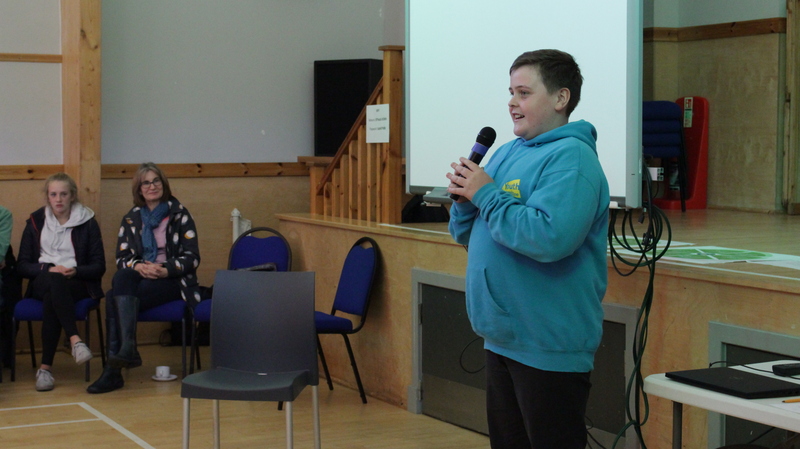 Aidan who recently completed his junior rangers certificate and sits upon the National Park Youth Forum was nominated by the Callander Youth Project Trust for his enthusiasm and voluntary commitment to protecting and enhancing the natural environment of the National Park. 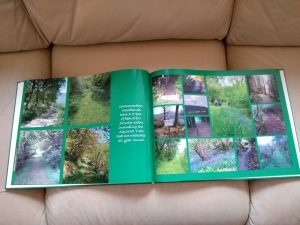 Writing regular wildlife and gardening articles for the Ben Ledi View he has also created a wonderful nature corner in the CYP youth space and encourages other young people to be more environmentally aware. Aidan is behind CYP integrating a nature day every Wednesday during their summer programme attracting over 100 young people. 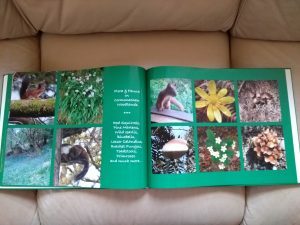 Aidan regularly hosts bird watching days, RSPB Big Garden Watches as well as bird watching quizzes and posting live videos from the day on social media. Well done Aidan, you are an inspiration! Unfortunately Aidan was unable to attend the event as he had other commitments on the day and will be presented with his award very soon. 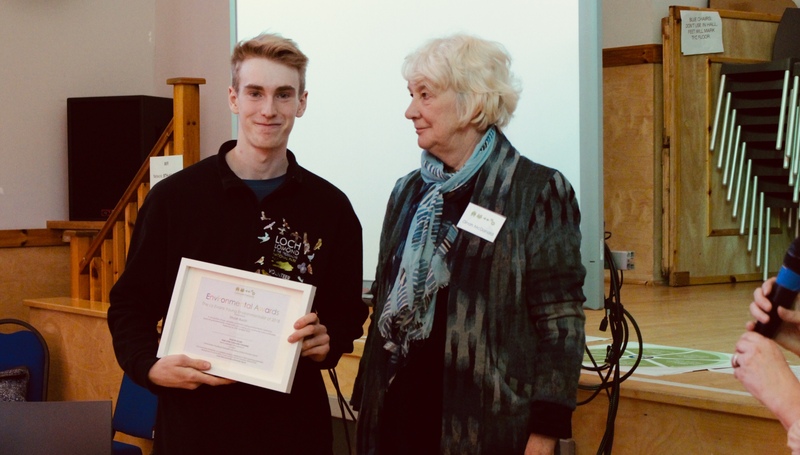 Receiving the award on his behalf and telling us a little more about Aidan was Steven Kent (National Park Authority Youth Ranger, and Callander Youth Project Trust). 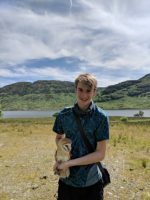 Struan joined the Loch Lomond and the Trossachs National Park volunteer programme because he wanted to experience a gap year enjoying the outdoors and the environment that he loves the most. Struan’s love for nature and wildlife has been his motivation to use his ornithological skills to survey wetland birds in on Loch Lomond, monitor the population of water voles in the Loch Ard forest, ringing Barn Owls as part of the Barn Owl monitoring programme, and repairing mountain paths with the Mountains and the People Project. All the projects that Struan has been involved have contributed and enhanced the diversity of wildlife and recreational opportunities that surround our rural communities, and thus encouraging eco-tourism. Struan is the first young person on the NP volunteer programme with an average age of 54, which can often be very daunting to a young person. However Struan’s enthusiasm and commitment has seen him fit right in and standout out as a worthy winner for this years awards! Congratulations Struan! To find out more about any of the work and projects above please get in touch at E: info@thecommunitypartnership.org.uk. Both recipients are inspirational young people in the conservation work that they do. 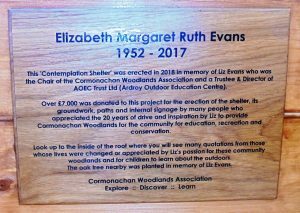 Regretfully Douglas Locke, husband of Liz Evans and the Secretary of the Cormonachan Woodlands Association was unable to attend the Gathering as he was the leader and first aider for the Volunteers Day in Cormonachan Woodlands that same day. This inspirational and unique community group has been doing outstanding work in environmental education and wildlife conservation for many years. Organising and facilitating inspirational monthly public talks, fundraising and awareness events, local wildlife recording, toad patrols (including frogs and newts), orchid surveys and regular reports for the Ben Ledi View their captive audience has grown within the community and to visitors alike. This year the group held stalls to highlight saving Scotland’s Red Squirrels, the Living Seas project plus selling a wide range of plants, including locally grown wildflowers, to raise funds divided between the wider work of the Scottish Wildlife Trust and Callander Primary school. Congratulations and keep up the fantastic work! 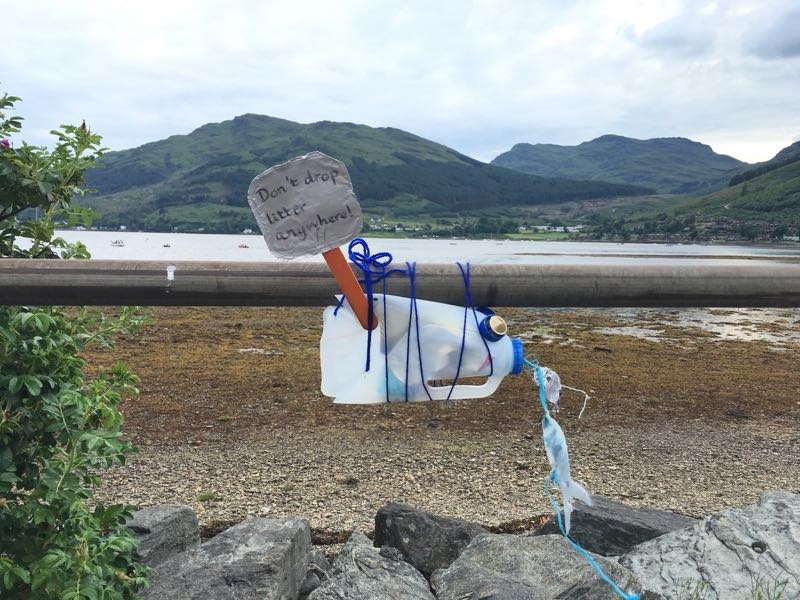 Sheron, since coming to live in Lochgoilhead has become an integral part of her community, most importantly organising numerous litter clearing events along the many local and surrounding beaches of Lochgoil. Sheron’s vigour and tenacity in organising and motivating others to get involved is why she deserves recognition for this award. Renowned for its natural beauty, the environment and community of Lochgoil has greatly benefitted from Sheron’s stalwart efforts and in an area of tourism within the National Park has made it a more pleasant and cleaner place to live and visit. Well done Sheron! Sheron Hambly is a member of the Cormonachan Woodlands Association. The above awards have today been featured in the Scottish Field. Please see link http://bit.ly/2qzCmOI. 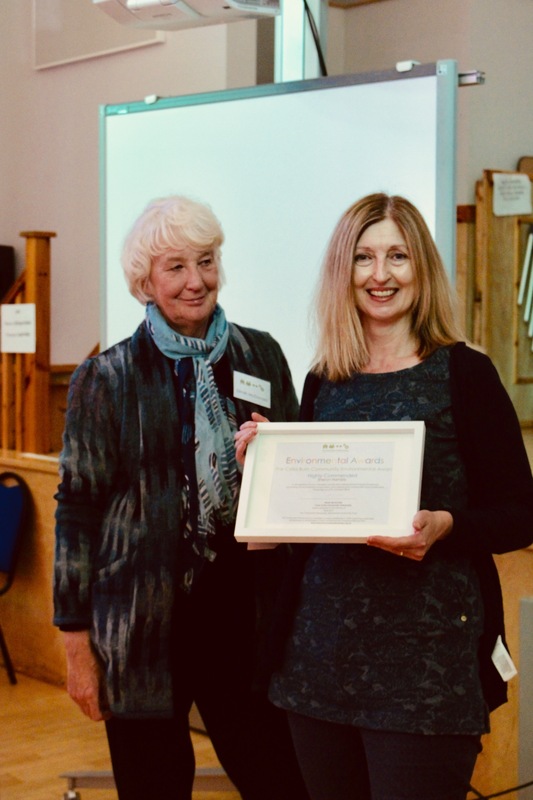 The Cormonachan Woodlands Association welcomes Gemma Shiarlis as its 100th Member supporting the work of the Association in preserving the Cormonachan Community Woodlands for Conservation, Education and Recreation. We would like to thank all our 100 supporting and volunteer members in helping to look after and maintaining these 58.9 ha of wonderful Ancient Atlantic Oak & Hazel Woodlands. 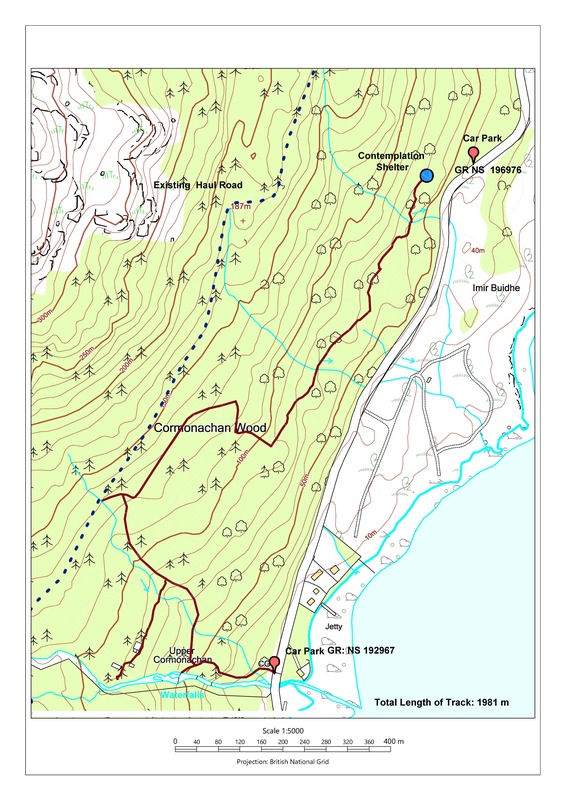 http://www.cormonachan-woodlands.co.uk/admin/wp-content/uploads/2018/01/logo2-300x68.png 0 0 Douglas Locke http://www.cormonachan-woodlands.co.uk/admin/wp-content/uploads/2018/01/logo2-300x68.png Douglas Locke2018-10-07 10:48:592018-10-07 10:49:09100th Member! 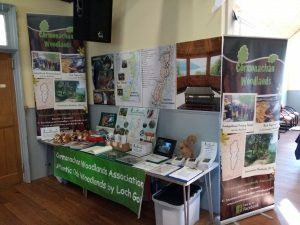 The Cormonachan Woodlands Association had a stand at the Autumn Fayre 2018 at the Village Hall in Lochgoilhead organised by the Argyll Arts Collective on Saturday 6th October. Three new members joined the Association at the event. 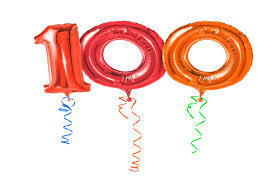 We now have 99 members – who will be the 100th? Visitors to the stand were able to look at the new high quality A3 Photo Book of Cormonachan Woodlands covering 20 years from 1998 to 2018. All 12 copies of the book have been sold prior to the event at the cost price of £36 each. All our stock of Cormonachan Woodlands mugs have now all been sold (we only had 3 left for the event from 30 sold) as have virtually all our stock of red squirrels and other soft toys. £9.50 was donated in our Project Donation Boxes and our total sales for the event came to £113.50. Thank you to all who visited our stand and who are supporting the Cormonachan Woodlands Association. The Cormonachan Woodlands Association is having a stand again this year at the Autumn Fayre on Saturday 6th October 2018 between 11 am and 2 pm at the Village Hall in Lochgoilhead. The event is free to enter. Come and find out about the work the Association and what its members and volunteers do for the Cormonachan Community Woodlands, Loch Goil by Carrick Castle, Argyll. 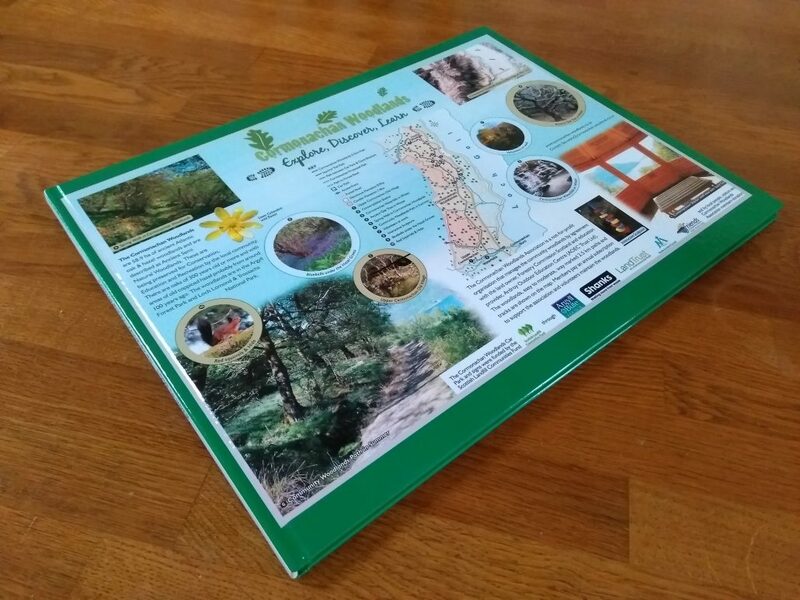 We will have our new 36-page high quality A3 Photo Book available for visitors to browse through that covers 20 years about Cormonachan Woodlands from 1998 to 2018. We are looking to increase our membership currently standing at 95 members with more supporting members that help pay for the running of the Association and volunteer members who help maintain the community woodlands. Individual local membership is £10 pa and Associate membership is £5 pa. Life membership is also available at £250 (we have 4 life members) and Corporate membership is £50 pa (we have 4 corporate members), Membership forms will be available at the event. 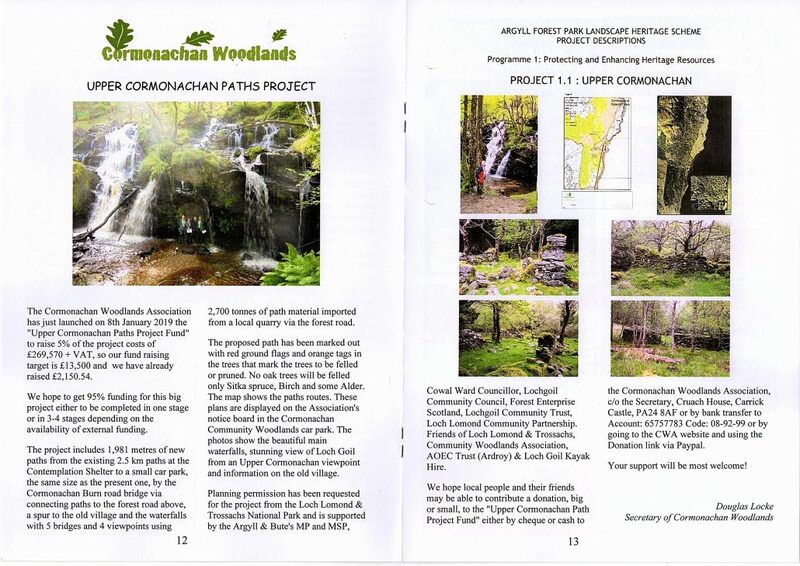 The Cormonachan Woodlands Association has produced a 36 page A3 photo book about Cormonachan Woodlands over the last 20 years from 1998 to 2018. 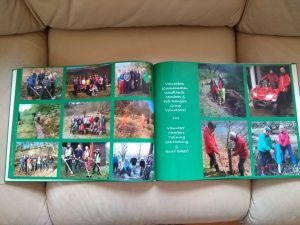 The cover is shown and two sample pages of some of the paths and volunteers who have helped to maintain the woodlands for the Loch Goil community. Anyone interested in purchasing a copy for themselves can order from the Secretary of the Association at a 50% discounted cost of £35.95 each if ordered now. Twelve have been ordered to 5/9/2018. Postage would be extra for those not able to collect or be delivered in the Loch Goil area. The Association’s copy will be held by the Secretary and may be borrowed locally by local members. Cormonachan Woodlands Mugs are available from the Secretary of the Cormonachan Woodlands Association at a cost of £7.50 each including boxed packaging – if postage is required for delivery, the postage cost is £2.95 each extra. Order by calling the Secretary on 01301 703098. We have just 10 mugs left at 5/9/2018. Two sides of the mug are shown here. The sale of these mugs helps support the running of the Association and its projects.